KK got off to a rocky start, settled in but the Phillies fell one run short and ended a 5-5 home stand. The loss dropped their Citizens Bank Park record to 17-24, certainly not the norm for the last five seasons. Before the Phillies came to bat, they were down five runs on four hits. KK yielded two hits and no runs through his next six innings. His season has been hit and miss. In five of his 12 stars, he’s allowed five earned runs or more (0-5, 9.69 ERA). In his other seven starts, two earned runs or less (2-2, 2.14). Meanwhile, the offense came close but once again couldn’t come up with a key hit. RISP was the culprit, 0-10. The loss was their 42. They didn’t get to that number last season until August 16. Following the game the Phillies headed for Miami and a weekend series in the Marlins’ new home. Next nine games will be against NL East rivals, a good time to get a good streak going. Winless Cliff starts the trip tonight. **Lehigh Valley romped, 10-1, over Rochester. LF Pete Orr, 3-4, three RBI, two steals. RHS Tyler Cloyd (7-1) was the winner, 1 run, 6 innings. RHR Michael Cisco, just up from AA, threw three scoreless innings for a save. Cloyd and INF Kevin Fransden have been named to the North squad for the All-Star Game. **Reading dropped a 5-2 decision to Richmond. LF Leandro Castro, single, 24th double, RBI. **Clearwater returned home and beat Lakeland, 7-1. C Cameron Rupp, double, 6th homer, two RBI. Win went to Brody Colvin (4-4), 0 runs, 7 innings, 9 strikeouts. **Lakewood packed in 8,000 fans for Ryan Howard’s rehab start. Scoring three in the last of the ninth, the BlueClaws edged West Virginia, 7-6. DH Howard was 2-4, 3 RBI. 1B Chris Duffy stretched his hitting streak to 14 games with a home run and walk-off two-run single. **Williamsport saw Auburn score three in the bottom of the ninth for a 4-3 win. 2B Tyler Greene, single, double, home run, RBI. 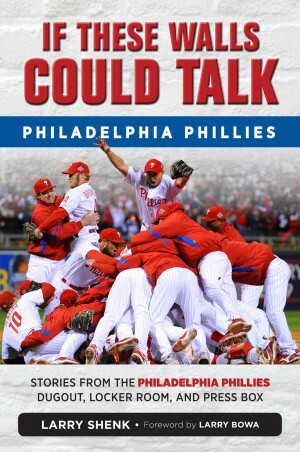 **Gulf Coast League Phillies won second in a row, 11-5, over the Blue Jays after starting the season 0-6. DH Williams Astudillo, 3-4, boosting average to .455. Check out new Alumni News & Notes at www.phillies.com/alumni. The season is normally 162 games in length. For the Phillies, it almost seems as sif they are having three different seasons this season, WC and WR. WC (With Chase) began last night, leaving 86 games left in that season. WR (With Ryan) is getting closer. If it is after the All-Star Game, that season has 75 games remaining. Opening day for the WC season was filled with excitement and electricity. That turned up a notch when he homered in his first at-bat, calling for a curtain call. When Chooch followed with another dinger, the place was really jumping. Two walks and a homer by McHenry in the next inning was like sticking a needle in a balloon. The excitement was sucked right out of the air at Citizens Bank Park as the Pirates romped, survived a late Phillies push and then added on. Because of the split doubleheader on Sunday, the Phillies turned to the bullpen. Six different relievers worked the game, tossing 183 pitches, 75 out of the strike zone. Chase’s debut was impressive but the Pirates spoiled the party. Series finale this afternoon, with the Pirates ace facing Kyle. Then, a charter flight to Miami and the start of nine games against the East leading up to the All-Star Game. **Lehigh Valley lost, 4-3, to Rochester. RHR B. J. Rosenberg (2-1) allowed a run in 3.1 innings for the loss; he struck out 5. **Reading beat Richmond, 7-4, behind Julio Rodriguez (5-1), 4 runs, 4 hits, 4 walks, 6 strikeouts, 6 innings. 14th save for RHR Justin Friend. **Clearwater bowed, 3-2, at Palm Beach as LHS Adam Morgan (2-8) was charged with the defeat, 3 runs, 4 hits, 5 innings. **Lakewood lost, 7-2, to West Virginia. DH-1B Chris Duffy, 2-4, extended his hitting streak to 13 games (.489). **Williamsport was a 2-1 winner at Mahoning Valley. 1B Chris Serritella hit his first pro homer in the sixth inning, the decisive run. 3B Mitch Walding, 1-4, RBI. **Gulf Coast League Phillies beat the Blue Jays, 5-1, in Dunedin, their first win after six losses to start the season. C Williams Astudello, 2-5, RBI; hitting .389. RF Dylan Cozens, 2-4, including a triple, 2 RBI. June 28, 1887: Phillies shut out Indianapolis, 24-0, which still ranks as the largest scored in a shutout victory in team history. June 28, 1994: LHP Fernando Valenzuela, signed out of the Mexican League, makes his debut for the Phillies with a no-decision in a 2-1 loss to Florida. Valenzuela allows an unearned run on six hits in six innings. June 28, 2004: 3B David Bell hits for the cycle in 14-6 win over Montreal at Citizen Bank Park. June 28, 2011: LHP Cliff Lee is the third Phillies pitcher to toss three consecutive shutouts (3-0 vs. FL, 6/16; 4-0 at StL, 6/22, 4-0 vs. BOS today). He joins RHP Grover Cleveland Alexander (1916) and (RH) Robin Roberts (1950). Alexander holds club record with 4 in a row in September 1911. Visit www.phillies.com/alumni for news, notes and photos of Phillies Alumni. In this topsy-turvy season, Chooch has been a rock of consistency, a true All-Star, if there ever was one. Online voting ends at midnight today and Chooch needs everyone’s help. He had another three-hit game last night that included his career-best 10th home run, which turned out to be the decisive run in a one-run win. He’s drive in 17 of his 41 runs in the seventh inning or later. That’s second in the NL to teammate Wigginton, who has 20. The night raised Chooch’s average to .361, almost 100 points above his .265 career average. He was the last Phillies catcher to hit .300, finishing with .302 in 2010. Phillies club record for a catcher is .368 by Smoky Burgess in 1954. Vance picked up his first win since coming off the DL on June 4. His ERA for those five starts is 2.70. The Phillies have a winning record on three days of the week, Wednesday (7-4), Thursday (7-2) and Friday (6-4). **Lehigh Valley won, 10-3, over Rochester. OF Jason Pridie, 4-5, double, two triples. Chase played all nine innings and was 2-5, home run, two strikeouts. RHR Tyson Brummett (3-1) picked up the win with 3.2 scoreless innings. **Reading beat Richmond, 10-2, as LF Leandro Castro had a single, two doubles (22) and four RBI. SS Troy Hanzawa, double, triple, 3 RBI. LHS Mario Hollands (2-0) was the winner, one run 6 innings. **Clearwater won, 5-3, at Palm Beach. Win went to LHS Austin Wright (7-2), 1 run, 7 innings. **Williamsport dropped a 6-2 decision at Mahoning Valley. 3B Mitch Walding, 2-3, boosting his average to .400. **Gulf Coast League Phillies unable to play for the second straight day because of tropical story Debby. June 27, 1963: RF Johnny Callison hits for the Phillies’ first cycle in 30 years in a 13-4 victory at Pittsburgh. In the same game, CF Tony Gonzalez’s seventh-inning error ends his major league record for outfielders of 205 consecutive errorless games. Check in at www.phillies.com/alumni for more phlashbacks. J-Roll’s on a roll and Joe-B is, too. Rollins hit his fourth homer in his last five games and Joe-B won his third in a row for the second time this season. Since May 25, J-Roll is hitting .345 with seven homers and 21 runs in 25 games. In his first 67 games, he hit four homers. Since that same May date, the Pirates are 18-9, best record in the NL. They dominate the Phillies at home (24-14), while the Phillies turn the tables at Citizens Bank Park (19-5). Joe-B gave up two earned runs in seven innings. In his seven wins, his ERA is 2.04. In his other eight starts, he’s 0-5 with an 8.12 ERA. Chooch chipped in with his 10th game of three or more hits. No other catcher can match that. Plus, he stole a base last night. Last Phillies catcher with three hits and a steal was Bobby Estalella against the Mets in 1996, according to Elias Sports Bureau. Fans can still vote for him for the All-Star Game through midnight Thursday on this site. **Reading lost for the second day in a row, this time 3-1 at Bowie. RHS Trevor May (6-6) gave up two homers in five innings while striking out seven. **Clearwater won its third in a row, 7-5, at Palm Beach before 424 fans. PB out-hit the Threshers, 13-8, but committed five errors. Clearwater also stole six bases. LHS Jesse Biddle (4-3) worked six innings for the win with RHR Hector Neris recording his sixth save. **Lakewood opened a homestand with a 6-4 win over West Virginia. 3B Maikel Franco was one of four BluleClaws with two hits. He drove in three. RHR Luis Paulino, a converted infielder who sat out all of last season with an injury, picked up the win (2-1). Michael Nesseth three hitless innings for his third save. **Williamsport won, 3-2, at Mahoning Valley on a two-run homer in the seventh inning by RF Brian Pointer. **Gulf Coast League Phillies game in Bradenton (Pirates) was canceled because of the tropical storm Debby. In Clearwater, both Carpenter Field and Bright House Field were under water. The Threshers are in Palm Beach on the east coast the next two games. The GCL Phillies are scheduled to play at Carpenter Field this afternoon and tomorrow. Check out www.phillies.com/alumni for photos and features on Alumni, including a “Where Are They Now” story on reliever Ron Reed. Rained out Friday . . . first blown save by Papelbon on Saturday that became on win on Thome’s dramatic, historic home run . . . 900th win for Charlie as a big league manager . . . split doubleheader loss on Sunday running the Phillies winless streak on that day to seven (May 13, last Sunday win) . . . 14 walks by Phillies pitchers that were turned into six runs in the series; Phillies received 10 walks, two scored . . . twice on Sunday the Phillies had a runner on third with less than two out and didn’t score which has been a bugaboo this season . . . wasted seven-scoreless inning start by Cole . . . 12th consecutive winless start for Cliff . . . an ankle injury for Schneider . . . news that Utley will play in Lehigh Valley on Tuesday and in Philly later this week. Try saying that in one breath. Now, the invasion of the second-place Pirates for a four-game series that begins tonight. It has been a while since the Pirates were this high in the standings and played a four-game series in Philly. A year ago, they came in after the All-Star Game break playing well and the Phillies swept three from them. **Lehigh Valley lost two of three at Columbus; held to 14 singles over last two games. RHR J. C. Ramirez picked up first AAA save on Friday. **Reading went 2-2 at Bowie. 3B Cody Asche, promoted from Clearwater where he hit .349, got off to a 1-11 start in first three AA games. **Clearwater won two of three from Daytona. RHR Tyler Knigge fanned six in two perfect outings of one inning each. **Lakewood went 1-2 at Hagerstown, the win coming Sunday behind LHS Ethan Stewart (4-8), his fourth straight win. **Williamsport won two of three vs. Auburn. 3B Mitch Walding was 4-5 on Friday, first pro homer and six RBI. Gulf Coast League Phillies: ended the first week, 0-6, including 4-2 and 2-1 losses to the Yankees over the weekend (league doesn’t play on Sundays). June 25, 1971: Pittsburgh’s LF Willie Stargell hits tape-measure home run off RHP Jim Bunning. The ball lands in the exit of Section 601, the longest home run ever hit at the Vet. For more Phlashback moments plus news, features and photos of Alumni visit www.phillies.com/alumni. Win the first two games of a three-game series and you have a chance for a sweep, elementary deduction to say the least. Facing a pitcher who is 0-1 with a 12.46 ERA and you have a chance for a sweep. J-Roll leads off the Phillies first with a home run and you have a chance for a sweep. In this strange game of baseball, the Rockies avoided a sweep and ended their five-game losing streak against the Phillies. After J-Roll’s homer, the Phillies offense hibernated. Francis, the Rockies starter, gave up hits to four of the first seven batters he faced and then retired 11 of the final 13 hitters. RISP for the Phillies? 0-9. In their last 35 at-bats with RISP, the Phillies have five hits for a .143 average, yet they won two of three. Strange game. Oh, I already said that. Vance certainly pitched well enough to win but took the loss, allowing a 2-out homer in the seventh. His ERA is 1.35 in his last three starts (0-2). Offense has scored five runs for him in those three games. Having lost two of three in DC, the Tampa Bay Rays wrap up interleague play for this season this weekend. Their 3.46 ERA is second-lowest in the AL. In interleague play, the Rays have a 12-6 edge over the Phillies, 6-3 in their home and 6-3 in Philly. **Lehigh Valley won, 7-4, in Toledo, a game that included a 2:34 rain delay. C Erik Kratz, 2-4, 7th homer. Win went to RH B. J. Rosenberg (2-0) with LH Jeremy Horst getting his second save. **Reading won, 9-3, at New Hampshire and then bussed to Bowie, MD. LHS Mario Hollands, promoted from Clearwater, was the winner, 3 runs, 6 innings. 2 RBI each from 3B Tim Kennelly, RF Miguel Abreu and 2B Cesar Hernandez. **Clearwater was blanked on 3 hits by Daytona. 3B Cody Asche, 2-4, 10th steal; hitting .349. DH Chase, 0-3 plus getting hit by a pitch. **Lakewood won its fourth in a row, 5-3, at Hagerstown. 1B Chris Duffy, 3-4, 2 doubles, 2 RBI, boosted average to .372. **Williamsport lost, 8-0, at State College, getting only 3 hits, 2 to RF Brian Pointer. **Gulf Coast League Phillies lost fourth in a row, 5-3, to Braves. LF Zach Taylor, 1st pro homer. RH Blake Mascarello, 2.2 relief innings, 0 runs, 4 strikeouts. **Futures Game: RHS Julio Rodriguez and RHR Lisalberto Bonilla of the Reading Phillies staff, have been selected to the World Team for the July 8 Futures Game in Kansas City on July 8. Pitcher–Bonilla. In 2 appearances, 1-0, 0.00 ERA, 5 innings, 4 hits, 0 walks, 7 strikeouts. Win came in Wednesday’s 2nd game, 2 scoreless innings; other appearance, 3 scoreless innings on Saturday, 2nd game, striking out 5; threw 40 pitches, 30 for strikes. Hasn’t allowed a run since May 27, 11 total innings, 4 hits, 0 walks, 13 strikeouts. Began season at Clearwater and joined Reading on May 5. Combined, 3-2, 2.02 ERA, for 24 appearances, 2 saves, 35.2 innings, 49 strikeouts, opponents batting .195. The 6-0, 175-pound right-hander turned 22 on June 18. He was signed as an amateur free agent out of Samana, DR, by Sal Agostinelli and Bernardo Perez in 2008. Player–RF Anthony Hewitt, Clearwater. In a week shortened by the All-Star Game break, he hit .375 in 4 games. Of his 6 hits, he had a double and 3 homers and led the organization with 8 RBI, coming on back-to-back 4 RBI games. Raised average from .227 to .244, highest in a month. For the season, 8 homers, 28 RBI, 6 doubles, 6 stolen bases in 47 games. Home run total is second in the organization to Darin Ruff (11). The 23-year-old was selected out of high school in the 1st round (24th overall) in 2008 and signed by Gene Schall. Also named the MiLB.com player of the week in the FSL. Phillies (5) and Cincinnati (3) combine for a Vet-record eight home runs in a wild 15-9 win over the Reds. One of the eight is a grand slam by SS Larry Bowa. RHP Rick Wise becomes the first pitcher ever to fire a no-hitter and hit two home runs in the game as he blanks Cincinnati, 4-0, at Riverfront Stadium. 3B John Vukovich snares Pete Rose’s hard liner to end the game. LHP Ken Brett sets an ML record for pitchers when he hits a home run in four straight games (9th, 13th, 18th). The fourth homer comes in a 7-2 victory at Montreal. Phillies destroy Chicago, 19-1, and set a modern league record with 15 extra-base hits and a new club record with 11 doubles. 2B Juan Samuel drives in six runs. LHP Shane Rawley (10-4) beats LHP Jamie Moyer (1-1). Rick Wise personally relives his no-hitter at www.phillies.com/alumni. Check it out. Well, Charlie won his 899th game as a major league manager last night. It was different and not easy. When J-Roll’s double in the bottom of the fourth tied the game, 5-5, it was the Phillies last hit until there were two out in the bottom of the ninth, a single by Ty. Before the ninth was over, the Phillies had their second walk-off win of the season. They’ve certainly been on the other end enough, eight times. Helton’s error in not touching first base allowed the winning run to score with two out as the Phillies rallied with two runs in the ninth after the Rockies had scored once with two out in the top of the ninth against Papelbon. He’s a different pitcher when not in a save position. Consider he is 17-17 in saves with a 0.00 ERA. Such as last night, 1-2, 6.10 ERA. Elias Sports Bureau: Prior to that rally, the Phillies had been the only team in the major leagues that had not won a game this season in which it trailed in the eighth inning or later. Since May 1, the Phillies have scored 228 runs, the most in the NL while hitting .276. At times that is difficult to believe because they have spells in games when the bats go quiet such as last night. The difference lies in pitching and defense. A year ago, the Phillies had the lowest ERA and fewest errors. They’re in the middle of the NL pack in both. Joe-B gave up only six hits in seven innings but three of them left the park. He now leads the NL in allowing homers, 17. If you are wondering about the Phillies club record, it belongs to Robin Roberts, 46, in 1956. The win boosted the Phillies record to 22-5 in the last 27 games against the Rockies, 13-2 in their last 15 games at Citizens Bank Park. Series ends tonight. **Lehigh Valley won, 2-1, at Toledo on a SF by 2B Kevin Fransden in the eighth. LHS Pat Misch (5-8) won his second straight, allowing just 2 runs in 13 total innings. **Reading dropped a 4-3 decision in New Hampshire. C Sebastian Valle, 2-4, including his eighth home run. RHS Trevor May (6-5) allowed 3 runs in the first inning and was charged with the defeat. **Clearwater nipped Dunedin, 3-2, on a walk-off single by Zach Collier. Chase played eight innings at 2B; 2-3 as a hitter, including his first home run. Win went to RHR Tyler Knigge (4-1). **Lakewood returns to action tonight following a three-day All-Star Game break. **Williamsport pounded out 17 hits in whipping State College, 13-1. 3B Mitch Walding, 4-5, 4 RBI. 1B Christopher Serritella, 3-4, 2 RBI. LH Hoby Milner (1-0), second of 4 pitchers, was the winner, 4 strikeouts in 3 hitless, scoreless innings. **Gulf Coast League Phillies lost, 9-6, at the Braves. LF John Taylor, 3-4. 2B Angelo Mora, 3-4, 2 doubles. June 21, 1964, 1st game: RHP Jim Bunning (7-2) pitches the first perfect game in Phillies history when he blanks the Mets, 6-0, on Father’s Day at New York. It is the major league’s first perfect game during the regular season in 42 years. Gus Triandos catches the perfect game and becomes the first catcher ever to be behind the plate for no-hitters in each league. 18-year-pld Rookie RHP Rick Wise wins his first major league game in the second game, 8-2. For more details on Bunning’s perfect game, visit www.phillies.com/alumni. Rick Wise recounts his first win on the same day and also his no-hitter seven years later, also on the alumni page. Back home and back to the kind of baseball expected from the Phillies, solid starting pitching, crisp defense, a couple of long balls and J-Roll scoring multiple runs. Cole started out a little out of whack, allowing five of the first nine Rockies to reach base, including walking the enemy pitcher in the second inning. After that, he settled in, retired 13 in a row and allowed only four more base runners. At the start of the season, he was slotted in as the #3 starter. He’s stepped up and is the ace. It is the sixth straight season in which Cole has reached double figures in wins. Club record is 13 by Steve Carlton. The offense overcame a 1-0, first-inning deficit, took a 4-1 lead and then added on in the seventh. Mayberry is warming up with the long ball (homers in three straight games) and Chooch had another pair of extra base hits. If he’s not in Kansas City for the All-Star Game, there’s something wrong, drastically wrong. The win ended a six-game losing streak at Citizens Bank Park. Park record is a seven-game spin in August of 2004. **Lehigh Valley lost, 5-3, at Toledo. SS Andres Blanco, 2-4, after 4-5 game on Monday. **Reading lost, 6-1, at New Hampshire. Lone run came on 12th homer by 1B Darin Ruf. **Clearwater lost, 8-2, to Dunedin. DH Chase, 1-3, plus a walk. 3B Cody Asche, 2-4, boosting average to .348. **SAL All-Star Game, North won, 3-2; Lakewood’s Colin Kleven was the winner, 1 inning, 2 hits, 0 runs, 1 strikeout. **Williamsport lost, 5-2, at State College. SS Roman Quinn, 2-5, stolen base; RF Larry Greene, 3rd inning RBI double was first hit as a pro. **Gulf Coast League Phillies lost, 7-5, at Tigers. RF Dylan Cozens, 2nd round selection, 2-4, 2-run homer in the 3rd for his first pro hit and an RBI single in the 7th. June 20, 1883: Boston wins, 29-4, the most runs scored against the Phillies. It happens again, June 15, 1887, this time a 29-1 loss to New York. June 20, 1900: Brooklyn scores seven runs in the 11th inning for a 20-13 lead. When the Phillies stalled in the bottom of the 11th, hoping that the game would be called by darkness, umpire Hank O’Day forfeited the game to Brooklyn. Hey, don’t forget to visit www.phillies.com/alumni. Being a traditionalist, I’m not a fan of the DH. Heck, I wasn’t sure about Phillie Phanatic when he/she/it arrived on the scene in 1978. Phanatic won me over. Still not a DH fan, however. Selfishly, it would help the Phillies if there was a DH. Thome was awesome as the DH on the just concluded trip that was a struggle. The 41-year-old is now relegated to pinch-hitting as his back isn’t conducive to playing first base again. The DH would also come in handy when Chase and Ryan return. Well, there is no DH in the NL right now, so it is a moot point. Is it time for baseball to have the same rules for the AL and NL? Your thoughts are welcomed. **Phillies gave up 34 unearned runs a year ago. Right now, they’ve given up 26 already and we’re not at the half-way point. 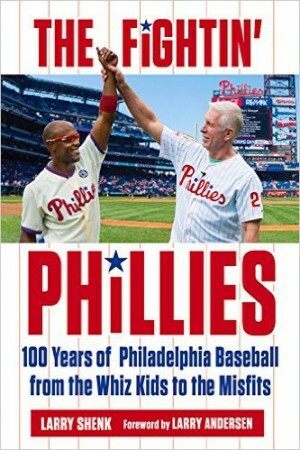 **Phillies are 12-19 at home; Rockies, 10-19 on the road. **Phillies are 4-12 in June; Rockies, 4-11. **Three NL division winners from a year ago are under .500: (Brewers 31-36), Phillies (31-37), Diamondbacks (33-34). **Rockies and Cardinals have scored the most runs in the NL, 329. Rockies are second to the Cardinals in homers, 84-82. **Rockies lead the league in runs allowed, 373 and ERA, 5.35. **When it comes to runs scored and runs allowed, the Phillies set club records for both in 1930. Team batted .315 and scored 944 runs. Pitchers allowed 1,199 runs and a 6.70 ERA. All of that in a 156-game season. Oh brother! **Lehigh Valley won, 6-3, at Toledo. RHS Tyler Cloyd allowed 3 runs in 6 innings but improved to 7-1 with the IronPigs. At Reading, he was 3-0. 2B Kevin Fransden, 2 doubles, 4 RBI. **Reading edged Akron, 4-3, on Miguel Abreu’s walk-off single, a game that started at 9:35 a.m. Following the game, the Phillies faced a bus trip to New Hampshire. **Clearwater pounded out 16 hits in crushing Dunedin, 11-7, in the first game of the second half. DH Drew Hillman had 3 doubles, one of 3 Threshers with 3 hits. Chase was 1-4 with an RBI. **Lakewood started a 3-day All-Star Game break. **Williamsport opened its season with a 6-2 win over State College. RHS Joshua Warner (1-0), 2 unearned runs, 2 hits, 6 innings. 2B Tyler Greene, 2-run triple. Paul Hagen has a great story on the young prospects playing with the Crosscutters on this site. **Gulf Coast League Phillies dropped their season opener, 6-1, to the Tigers, getting only 3 hits. Rick Wise recounts his first major league win which followed Jim Bunning’s perfect game in 1964 and his 1971 no-hitter at Cincinnati in a feature called Alumni Views. Check it out. Their hottest hitter now goes to the bench. That’s the story of the Phillies as a nine-game interleague trip ended with a Blue Jays sweep in Toronto yesterday afternoon. Thome had 12 hits in the nine games, including four homers, and 14 RBI. He was the DH but now becomes a pinch hitter as interleague play on the road is history in 2012. Thome entered the record book with yesterday’s homer. As has been well documented, he joins A-Rod, Reggie Jackson and Darrell Evans as the only players in baseball history to hit 100 home runs for three different teams. Phillies scored 46 runs on the trip, while batting .268. The enemy batted .276 and scored 52 runs, seven unearned as the Phillies committed 10 errors. It seemed like an awful trip but if you want awful, go back to the 1928 Phillies. Visiting each of the seven other cities, they went 2-17. The last three Saturdays and Sundays, the Phillies are now 0-6. The Phillies return to the NL Tuesday night hosting the struggling Rockies and then end interleague play with the Rays at Citizens Bank Park this weekend. Tampa leads the Phillies, 12-6. Ugh. Lost weekend was a lost opportunity to gain some ground in the standings. Check the standings today, all teams in the NL East lost yesterday. In the AL East, all won. **Lehigh Valley took two of three from Durham over the weekend. OF Domonic Brown aggravated his left knee Thursday and didn’t play. **Clearwater was off for the Florida State League All-Star Game, won by the South on Saturday night. Clearwater’s RHR Tyler Knigge took the loss. **Lakewood swept three from Hickory. LHS Ethan Stewart (3-6) won on Sunday, his third straight win. **Williamsport Crosscutters open the New York-Penn League season tonight hosting State College. **Gulf Coast League Phillies play their first game at 12 noon today, hosting the Tigers. June 18, 1948: After a 9-1 record with the Wilmington Blue Rocks, RHP Robin Roberts makes his major league debut, a 2-0 loss to Pittsburgh at Shibe Park. June 18, 1989: Following the Phillies’ 6-5 win over New York, GM Lee Thomas pulls off two major trades, sending 2B Juan Samuel to the Mets for CF Lenny Dykstra, RHP Roger McDowell and a minor leaguer and sending RHP Steve Bedrosian to San Francisco for LHP Terry Mulholland, LHP Dennis Cook and 3B Charlie Hayes. Visit www.phillies.com/alumni for more great moments in Phillies history.